AMERICAN’s trench adapter is a fully adjustable valve box and extension stem system that is available in trench depths ranging from 3 feet to 20 feet. Both the valve box and the extension stem adjust to grade in a matter of seconds, completely eliminating the need to cut extension stems in the field. You simply raise the upper pipe to the proper height and lock it into position. Now you have not only adjusted the height of the valve box, but you have also raised the extension stem and operating nut to grade as well. This adjustment is accomplished by the use of a coupling gland, which includes a split O-ring that, when hand-tightened, locks the trench adapter to the desired trench depth. The trench adapter eliminates the problems of trying to locate and engage the operating nut on the valve. With conventional valve boxes, the valve operating nut is several feet below grade, making it difficult to locate and to align the T-handle wrench on the operating nut. This is especially difficult if the valve box is filled with debris, mud, and water. 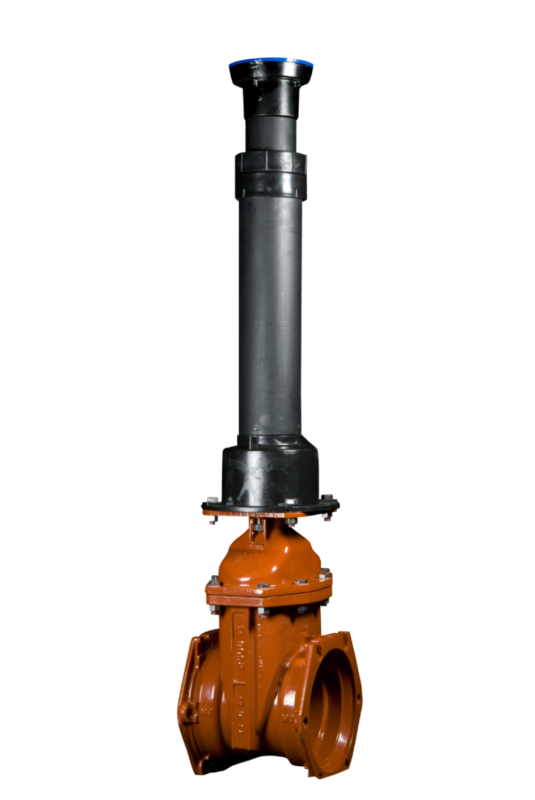 The trench adapter assures that the valve can be operated at ground level. Simply remove the lid, and then the operating nut is accessible and ready to use. A grit and stem washers support the extension stem in the top section of the valve box. The grit washer is designed to keep dirt and grit from entering the valve box interior. The valve box locking lid is color coded and includes cast markings to indicate potable water, sewer, re-use water or gas. Operating nut will always be at groundline. No more struggling to find the operating nut to operate the valve. Simply remove the lid and the operating nut is there. Each trench adapter now includes AMERICAN’s self-centering alignment ring. This two-piece ring installs in seconds and locks in place under the wrench nut of the valve. The centering ring aligns the valve box dead-center over the valve. The sides of the alignment ring are 1-1/2" high, which aids in keeping the valve box in a vertical position while backfilling the trench. This makes correct installation of a valve box easier than ever before. The alignment ring can be purchased separately for use with standard valve boxes.